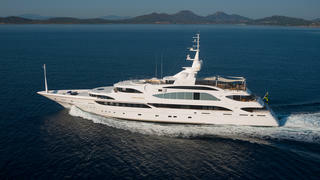 The 62 metre motor yacht Mine Games, listed for sale by Galati Yacht Sales, has been sold with the buyer introduced by Ann Avery at Northrop & Johnson and Shannon McCoy at Worth Avenue Yachts. Built in steel and aluminium by Italian yard Benetti to Bureau Veritas class, she was delivered in 2010 and is MCA compliant. Flexible accommodation is for up to 14 guests in six cabins consisting of a three-roomed master suite, a VIP suite on the bridge deck, three doubles and a twin plus two Pullman berths. In addition, there are quarters for 16 crew. The main deck saloon is paneled in burl wood and features an aft bar area with fridge and ice maker, coffee tables, two large sofas and four armchairs. The dining saloon is divided from the lounge area by a central pop-up television console and includes a black lacquered dining table with seating for 12 guests and a stunning crystal chandelier. The sky lounge is located on the upper deck and is fitted with corner sofas, armchairs, an entertainment centre including a television screen and a baby grand piano, while an aft door leads out to the al fresco dining area. The sun deck is accessed from the central elevator aft of the sky lounge deck. Entering from the aft staircase there is a centrally located raised helicopter deck, which doubles as a lounge/sunbathing area with loose outdoor furniture and covered awnings. Forward of the helicopter deck is a round dining table with a television area further forward. Starboard of the dining area is an updated bar area with a teak bar top. Twin 1,800hp MTU diesel engines give her a cruising speed of 15 knots and she is fitted with Quantum zero speed stabilisers. Mine Games was asking $29,950,000.